Ukiah’s Finnie ran the fastest time in the State in 1897 at 2:06.2. 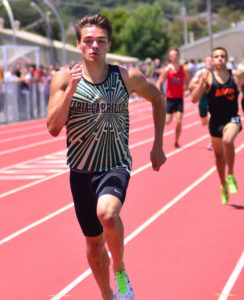 Analy’s Roy Williamson won the 1917 North Coast Section Meet of Champions 880 yard run in 2:06. 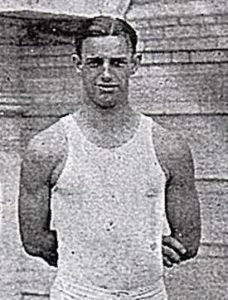 Petaluma’s Les Schwobeda, as a junior, would win the 1921 NCS MOC in 2:04.6 followed by a 2nd place finish at state. His senior year he would again win the 1922 NCS MOC in 2:02.4 followed by another 2nd place finish at state. Napa’s Jim Lytjen would take 5th at the 1940 State meet. Willits’ Jerry Siebert would go on to take sixth in 1960 Olympic 800m final in 1:47.0. As a junior in 1955 he would win the NCS MOC 880 in 1:59.0. 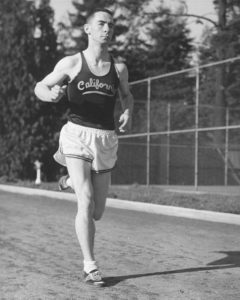 In 1956 he would win both the NCS MOC (1:57.1) and the state finals in 1:53.8, 2nd fastest time in California history. Montgomery’s Geoff Ramsey was the 1973 NCS MOC champion in 1:55.0. Vintage’s Mark Hadley would lower Siebert’s Empire record in 1974 with a time of 1:52.6. Petaluma’s Dan Aldridge still dominates the Empires performance list the top five times and nine of the 21 fastest ever. He ran the 800 meter equivalent of 1:49.31 while winning the 1975 NCS 3A meet before winning the NCS MOC 880 in 1:50.3, both were meet records. He would take 2nd at state in 1:51.1. He is also a member of the still standing 4 x 800m Relay record of 7:50.10 from 1974. (Jim Judd, Dan Aldridge, Phil Bond, Jon Sisler, 7:52.7y, avg 1:57.53). The NCS & CIF finals changed from 880 yards to 800 meters for the 1980 season. Our local meets did not switch until 1981. Montgomery’s Dave Rodriquez would place in the top eight in this event at state all three years. In 1979 he would win the NCS MOC 880 in 1:54.6 then take 8th at State. 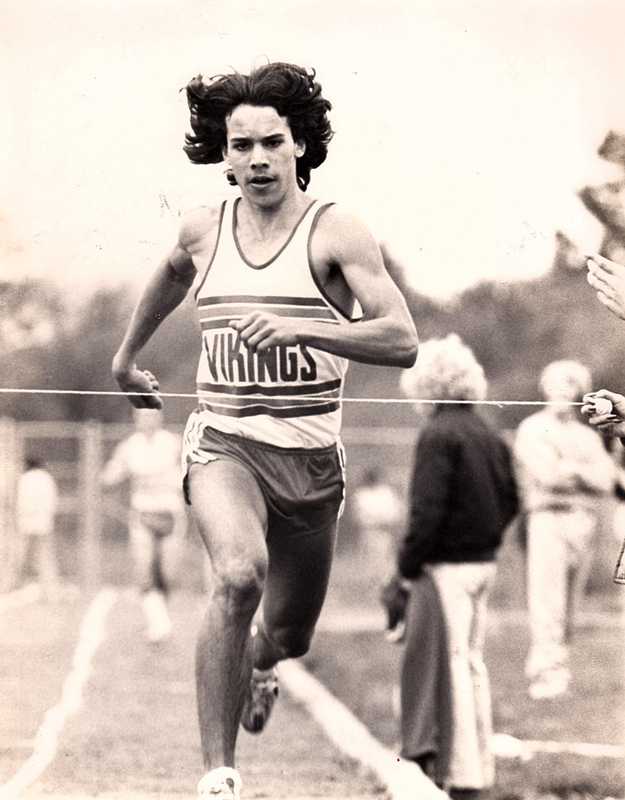 In 1980 he would medal at 5th in the State 800 meters in 1:51.87. In 1981 he would finish in 1:51.54 for 7th at State,, only Aldridge has a faster time than this. His 400/800 times make him our fastest combo runner ever in those events 49.75, 1:51.54. He has seven of the top 50 marks all-time for the Empire. In 1986 Montgomery’s Mark Spina won the NCS MOC in 1:53.85. At the State meet he would medal in 5th in 1:52.36. Spina is the only runner in NBL history to win this event all three years. 1984 1:55.7, 1985 1:57.7, 1986 1:56.5. Rodriquez hardshipped thru NBL’s his senior year. 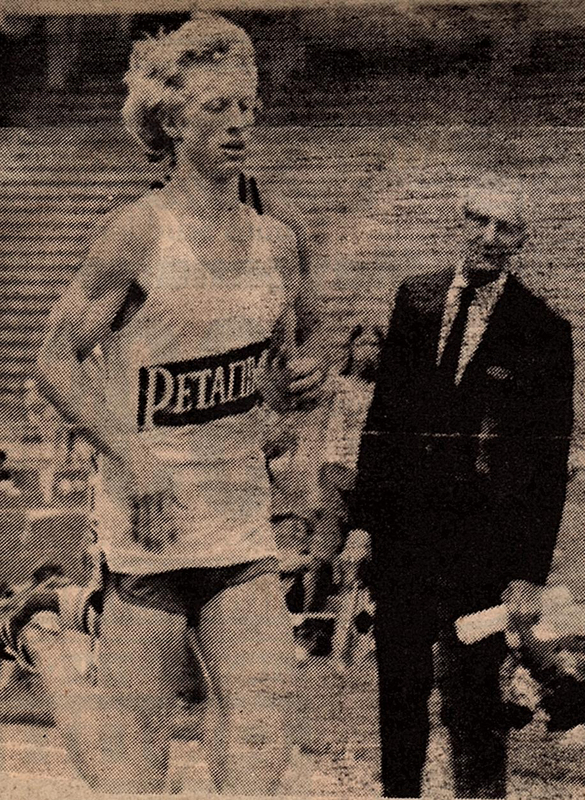 Santa Rosa’s Dan Held took 8th as a junior at the 1989 State meet in 1:54.26. In 1990 he would win the NCS MOC in 1:53.05, then take 2nd at the State meet in 1:51.86, only Aldridge and Rodriquez have a faster time than this. He has five of the top 50 marks all-time for the Empire. 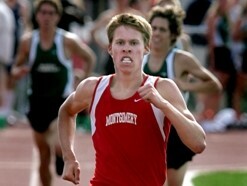 Montgomery’s Blake McDowall was our next NCS MOC winner at 1:53.98 in 2007. He went on to medal in 5th at State in 1:54.49. 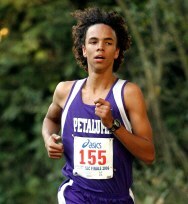 Petaluma’s Sterling Lockert is the only runner in SCL “NBL Redwood” history to win this event all three years. 2007 2:01.5, 2008 1:58.8, 2009 1:55.4-meet record. Maria Carrillo’s Dante Hay placed 7th in the 2014 State meet in 1:52.36. 18 of the 50 fastest runs have been since the year 2000 or the last 18 years, with 12 happening in the next 18 years (1982-1999) and largest amount 19 in (1964-81). 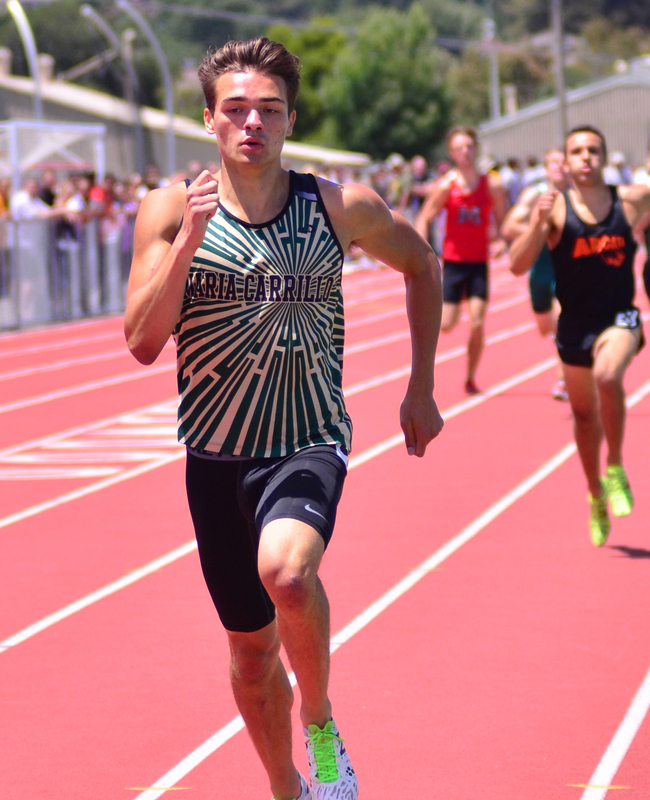 Montgomery has five different runners in the group accounting for 16 of the 50 marks with Santa Rosa and Casa Grande being the only other schools with more than one boy. Perez who only has a single mark on the 800 list, he does have 6 of top 33 1600’s, has the only mark in the top 10 for the 800 in the last 27 years. Piner’s Pat Leonard not only has the highest jump ever at 7-0¼ but he had a total of 16 meets over 6-8. Best year for the High Jump was 1989. Santa Rosa’s Gabe Manville produced our first ever seven foot jump to win the North Coast Section that year before taking second at state (6-10) with St. Vincent’s Paul Maloney taking 4th at 6-9. Manville would clear 6-8 or better 10 times this year with Maloney doing it 4 times (6-9¼ PR) and Piner’s Eric Birkenes also clearing 6-8 that year. Casa Grande’s Kevin Brogran and Montgomery’s Joe Bill Evett clearing 6-7 in 1989 as well, that’s five guys over 6-7. Montgomery’s Tom Buzzard produced a 6-8½ jump back in 1973 for the oldest jump on the list before Analy’s Dave Swanson would crush all the records as a junior 6-9 and then a 6-10½ as a senior and a total of 6 jumps over 6-8. Competing against him was Cloverdale’s Craig McMillan who looked like he might become our first seven footer having cleared ,6-5 freshman 1981, 6-7¼ 1982, 6-9 1983, before being ruled ineligible to compete as a senior in ’84 because of a basketball tournament he played in. Only one jumper in the last nine years has earned a spot on the list and that is Rancho Cotate’s Justin Zinnerman who had two jumps over 6-9 and a trio at 6-8, giving him the fourth highest total behind Leonard, Manville and Swanson. The boys triple jump became a CIF event in 1971. Santa Rosa’s Jim Brown got the event off to a strong start for the Redwood Empire that year with four jumps over 45-6¼ including an NBL meet record of 46-5½ and a season best of 47-4¼, a mark that has only been beaten on nine occasions by three athletes since. The 1977 season (5) and 1978 (14) would produce nearly half 19 of the 45 of the longest jumps ever. Leading those seasons were Piner’s Marvin Colter with 13 jumps over 45-7½ and six of the nine farthest ever with an Empire record jump of 48-7 that has only been better once by a half inch. He still holds the SCL meet record at 47-0 from 1978, was the NCS MOC champion that year at 47-2, our only MOC TJ champion to date, and placed 5th at the state meet at 48-4½. He is still the only Empire triple jumper to ever place in the top 8 at state. Colter was not unpressed during those years as Santa Rosa’s Ray Marchbanks, competing in the NBL, has the third jumps over 45-6 with five past 46 feet and a best of 47-9. 1978 also produced a third great jumper dominating the CMC in Cloverdale’s Allen Kuhn who had a best of 46-11½, 12th performance and fifth performer All-Time. 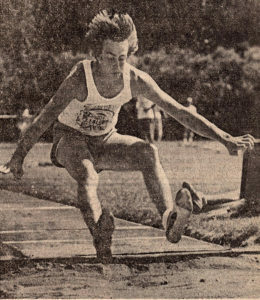 In 1981 it was all Petaluma as Rob McCorkel, three jumps over 46 feet including what is still the Empire record of 48-7½. Teammate Jeff Johnson is tied for fourth for the most jumps over 45-6 with four and a best of 46-3. McCorkel’s senior year, 1982, he produced four more jumps making the list giving him the second highest total at seven over 45-6. The only other jumper to have more than two jumps in the top 50 is Piner’s Aaron Braxton who also had three over 45-6 with a best of 46-0. 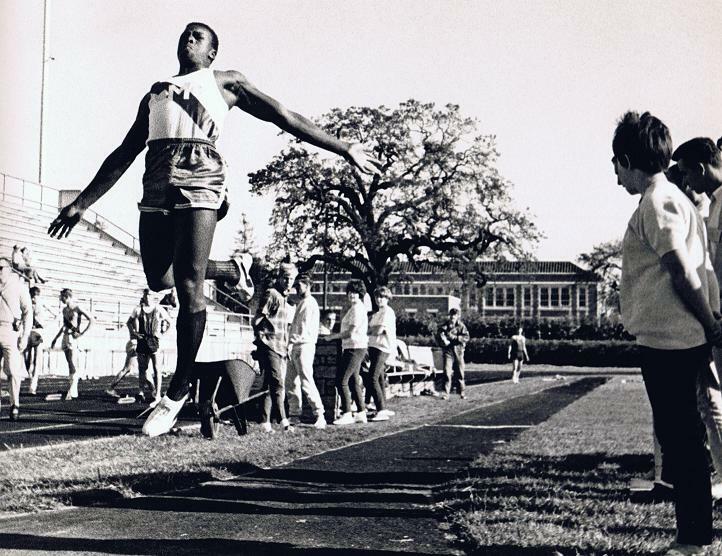 Since then only two Rancho Cotate jumpers have had a single jump over 46 feet (Jermaine Brown 46-1 1988 and Maurice White 46-0¼ 2001). In the last 17 years only three jumps have cracked into the top 50. Ralph Rose held the Empire shot put record for 37 years and did things no other Track & Field athlete from around here will probably ever do. Three athletes won state championships in the shot put before World War II but as far as our current performance list goes no one compares to Santa Rosa’s Dennis DeSoto. Oldest marks on the Non-DeSoto list go to Ukiah’s Bill Hook (57-2 1958) and his brother Dan Hook (58-8½ 1966). Then in 1977 came our next great thrower in Analy’s John Balletto who destroyed all the local records. His best of 59-10 was more than a foot farther than anyone had ever thrown and he finished with the ten best throws ever all over 58-10, eight of which are still among the 50 best ever. Then along came DeSoto. As a junior he became our first 60 footer twice breaking Balletto’s record with a best of 60-7¼ in 1980. During his senior year he opened with a 63-1 monster toss on March 3rd 1981 and continued destroying fields through out the year with what is still the 16 longest throws ever and a best of 63-10½ at the NBL Finals. 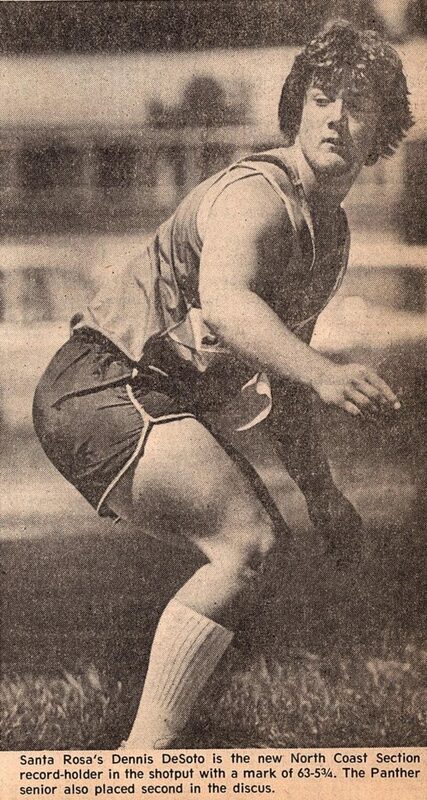 He held the NCS meet record until 2016 and earning second (63-6¾) at State in 1981. No one would break into his top 30 throws, all over 59-10¼, until 1995 when Cardinal Newman sophomore sensation Brian Chase would shock DeSoto’s class record of 54-3½ with a best of 61-2. Chase would improve to 61-8 his junior year and end his prep career with a total of ten throws over 59-1½. Only a single throw since then would make the top 50 throws ever that being by Daniel Erdman of Healdsburg in 2007 with his 59-5½ best. Chase would have 22 marks over 56-6 with Balletto at 14 and Erdman at 7. No one since then has come close to any of those marks except Cardinal Newman’s Nolan Nagle in 2013 with his 56-5 best.